Fire up the grill! Check out our favorite Father's Day recipes. Total Time: 70 minutes; 10 minutes active Servings: approximately 12 Why make your own barbecue sauce? 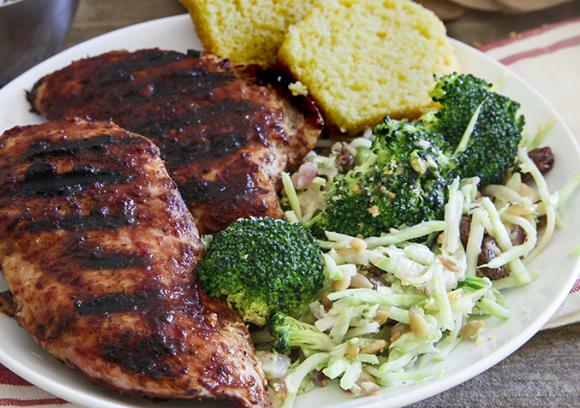 This sweet, smoky, spice cherry chipotle barbecue sauce is one mouthwatering reason. Place all ingredients in a blender or food processor. Blend until well combined and transfer to a saucepan. Cook, stirring occasionally, on medium heat for about 60 minutes until sauce is reduced by half, or reaches desired thickness. Take advantage of in-season fresh cherries and make a double batch of this slightly sweet, slightly spicy sauce. Serve with barbecued chicken, pork or burgers, or drizzle over smoky marinated tofu steaks. Serve this version of southern Germany's popular “Kartoffelsalat" alongside grilled meats or hearty grilled tempeh. In a large pot, boil the potatoes in salted water 14–15 minutes, until just tender. Drain, and when cool enough to handle, cut the potatoes into 1/4-inch slices or 1-inch cubes and place into a mixing bowl. If using bacon, sauté the bacon in a large skillet for 4–5 minutes while the potatoes are cooking,, drain off most of the fat, and return the pan to the stove. Add the onions and sauté another 7–8 minutes. Add the stock, vinegar, and mustard and simmer for a few more minutes. For a vegetarian potato salad, sauté the onions in 1 tablespoon of vegetable oil for 7–8 minutes. Add the stock, vinegar, and mustard and simmer for a few more minutes. Toss the hot dressing with the sliced potatoes. Season with salt and pepper, and stir in the fresh parsley (and vegetarian bac’un bits for the meatless version) just before serving. This is a version of southern Germany’s popular “Kartoffelsalat.” Serve warm or at room temperature with grilled meats or sausages, or hearty grilled tempeh. A delicious tofu burger topped with coleslaw and dill pickles. Place onion in a small bowl, cover with cold water and set aside. Stand tofu on its long narrow side. Cut lengthwise into 4 rectangular slabs, each about 1/2 inch thick, and pat dry. Sprinkle with salt Heat oil in a large nonstick skillet over medium heat. Add the tofu slabs (depending on the size of your pan, the tofu may slope up the sides a little). Cook until browned on both sides, about 4 minutes per side. Reduce heat to low. Add barbecue sauce and carefully turn the tofu to coat with the sauce. Cover and cook for 3 minutes more. Meanwhile, combine coleslaw (or cabbage), mayonnaise, vinegar, garlic powder and pepper in a medium bowl. Drain the onion. 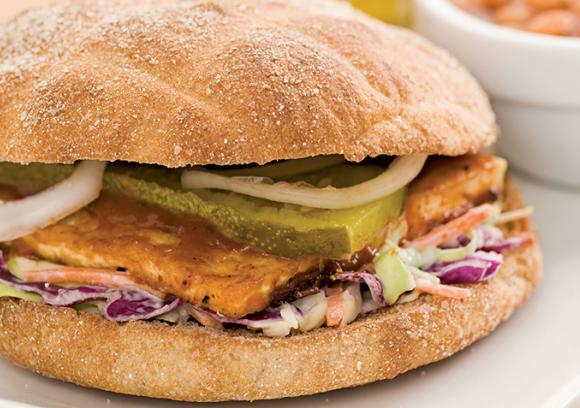 To assemble sandwiches, place about 1/3 cup of the coleslaw (or cabbage) mixture on each bun and top with a tofu slab, a pickle slice and a few onion slices. Spread any sauce remaining in the pan on the top buns. A salad version of America’s favorite sandwich. Shredded tomato is the base for a creamy tomato-and-chive dressing. Preheat oven to 350°F. Toss bread with oil and spread on a baking sheet. Bake, turning once, until golden brown, 15 to 20 minutes. Cut 1 tomato in half. Working over a large bowl, shred both halves using the large holes on a box grater. Discard the skin. Add mayonnaise, chives (or scallion greens), vinegar, garlic powder and pepper; whisk to combine. Chop the remaining 3 tomatoes. Add the tomatoes, romaine and croutons to the bowl with the dressing; toss to coat. Sprinkle with bacon.